Sherry and I have now made 8 trips to southern africa photographing wildlife. 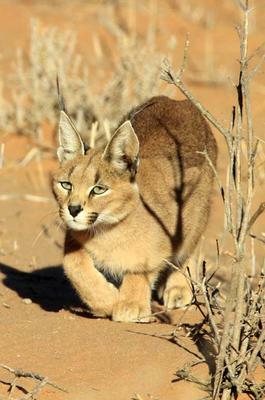 One of our goals has been to photograph a Caracal. 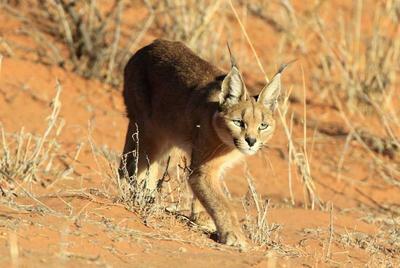 This April on our second trip to the Kalahari we were successful! We had actually driven past the cat and Sherry identified it looking backward. At first it looked like the only shots we would get were as it walked away, but it turned around, the sun came out and he/she posed for us. We took a couple of hundred shots, hope you enjoy these. Wow Bob and Sherry what a rare sighting and you got some great shots- not always easy with these cats because they don't stick around, let alone pose for these great shots. Thanks for sharing your great experience with us. 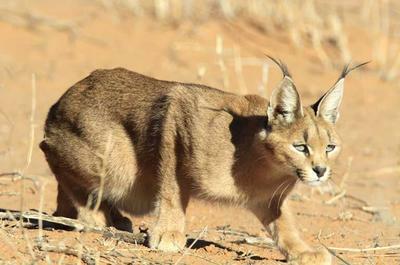 Great shots of a rare sighting - have been going to Kgalagadi for years and have not had a sighting like let alone a photograph - well done and thank you for sharing. The photos were taken almost 10K north of the Twee Rivieren gate on the way to Nossob. It was on the left side of the road. Lovely, lovely images! Where did you see him? 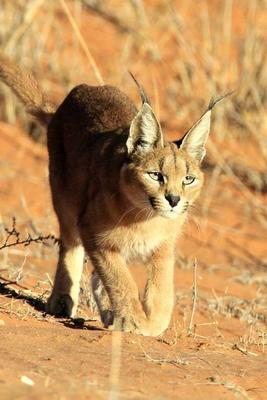 This is a great sighting Bob - we have only seen two of these cats at night from far off. Your images are close and in good light - well done!